The Tot Testers are juice and milk drinkers, with the occasional home made milkshake made by 20somethingmum. However much they are blended, they still wont go through the teat of a normal bottle. Yazoo are the nations favourite brand, and have been making and selling yogurts for years- I remember them on display at school. But we have never bought them ourselves, mainly due to the pressure on parents to be food detectives and not feed the kids anything which may bring the food police out to raid your fridge. However, Yazoo are not as bad as they would first appear! They are made to government approved standards- one of few brands which are, as it contains less than 5% sugar, and is also free from preservatives. Its a great way of giving your children calcium, and it contains Vitamin B too. Well, both the Tot Testers liked the strawberry variety, it has a good colour, in that its not so neon pink as to make you wonder how much colouring has been added. It has a soft strawberry taste, and you can also taste the milk too, something which is apparent in all the flavours. Little Tot really liked the banana flavour-again, this is the same colour as the homemade one, and smells like banana too- something which put off the ever fussy Big Tot, who, like her parents, is not a fan of banana! 20Somethingmum, who thinks of herself as a chocolate connoisseur, found the chocolate flavour gorgeous, and very chocolaty, with no hint of a synthetic taste to it. It was quite thin, as I prefer my milkshake to be quite thick, but when you consider they are aimed at kids, this is obviously why. A great lunchbox filler, which wont leave a guilty cloud hanging! Another very well known brand, McCain is at present trying to reinvent itself as a healthy family brand, and to educate the consumer that chips are still OK to eat! Their new skins on product, from their Rustic range, are chips like your gran used to make! They are thick, square chips, and as the name suggests they have their jackets on too. The packaging screams at you that these are not to be demonised in the healthy living stakes, as they contain just 3% fat and no cholesterol either. The chips are fat with a capital F, and look like potatoes should look. They cook just as swiftly as any other oven chip range, and don't glisten with fat either when you take them out from the cooker. We served them to the Tots, who as a rule have chips on occasion but without salt or vinegar. They do have a bit of sauce on the side, and both Tots found that the chunkiness of them made them much easier to eat-especially Little Tot whose motor skills are still developing. Big Tot loved dunking them in her sauce, and both cleaned their plates. The chips are filling, its almost like eating a plate of mash to be honest as it fills you up after a small handful, so they will last longer than skinny Minny fries. I would say that I found when I ate them that salt and vinegar is a must, or they taste like roast potatoes rather than chips. But they are full of potato flavour, and are dry enough to reinforce the less fat banner. We liked these as a healthy fast dinner item for Mum's in a rush. An interesting item to try as we have never had Greek yogurt before, and the lack of fat and added nastiness was ideal for a Mum on a diet kick, missing her usual treats. We are lucky enough to have a chef in our home at the moment, who knew what to do with greek yogurt. 20Somethingmum likes a yogurt, but likes it to taste of something, whereas the plain strained varieties were a bit bland. However, when they are mixed with something, these yogurts come into their own. We had ours made into a dip with a Mexican meal, and they gave just the level of cooling flavour to the dish it needed. It also went very well when drizzled with olive oil over a salad. I'd have never have thought of chucking my usual yogurt over a salad! The variety I really enjoyed was the yogurt which had a pot of honey on the side. When mixed together this was absolutely divine, and was a great alternative to late night bowls of ice cream. Big Tot even liked the Honey and yogurt combination, which is high praise indeed! 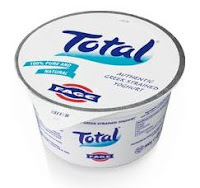 Total are a healthy brand, ideal for those of us still trying with our Post-Christmas dieting, as they are versatile and last ages in the fridge. You can literally whack anything in them, both sweet or savouring, to provide a different taste everytime.